Can you believe E.T. (The Extra Terrestrial) made its way to the theaters over thirty years ago? I feel so old! E.T. was one of my favorite childhood movies and I still watch it…..with my kids, of course! So in honor of E.T.’s 30th anniversary and its release on Blu-ray for the first time ever, Madame Tussauds immortalized E.T. just a couple of days ago at several attractions around the world, including London, Amsterdam, Berlin, Sydney and Hollywood. Tokyo will also add E.T. to its collection in March, 2013. All six E.T. figures were worked on simultaneously by a huge creative team at Merlin Studios in West London, using photographs and footage from the film as reference. 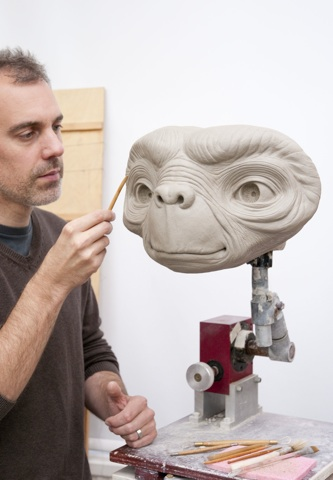 Guests will also be able to take Elliott’s place in the scene that showed E.T. and Elliott soaring through the air on a BMX with the moon as a back drop, which was voted by fans as Universal Pictures’ most memorable movie moment. Other scenes will be available as well. Pocket BLU™ App: The popular free pocket BLU™ app for smartphones is now even better with newly updated versions for iPad®, Android™ tablets, PC and Macintosh computers, with features made especially to take advantage of thedevices’ larger screens and high resolution displays. If you loved E.T. as a kid or even love the movie now, you need to purchase the anniversary edition which includes a Blu-ray disc, DVD and a digital copy for your smartphone, tablet and/or iPad. The best part about the anniversary edition are the deleted scenes, the cast interviews from “A Look Back” and the reunion. Now that we own the Blu-ray Combo Pack, there is no other way to view E.T. on the big screen. It’s also a great Halloween movie for the whole family! Remember what E.T. dressed as? Disclosure: Thanks to Universal Studios Home Entertainment for sending me a review copy of E.T. No compensation was provided. All opinions are my own. I feel old too! This is one of my favorite movies. Love the part when the kids are touch it and the artist is painting the details on ET.